Garden decking can soon start to fade if neglected..
As well as attracting dirt, the grooves in between the wooden planks can fill up with moss and other types of algae. 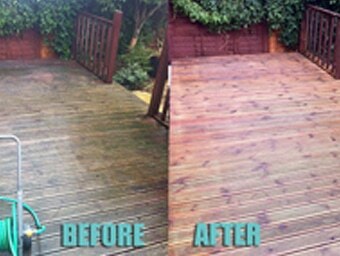 This in turn can cause a dangerous slip hazard, as there remains little friction on the surface of the decking. Further more, this build up of dirt can prove difficult to move by merely washing and sweeping it. The surface soon become covered in algae and moss other forms of surface growth if not looked after. This will result in the it becoming quite slippery in damp or wet conditions which can make it very dangerous to move about on. Here at aquablast we will steam clean it to get it back to new.